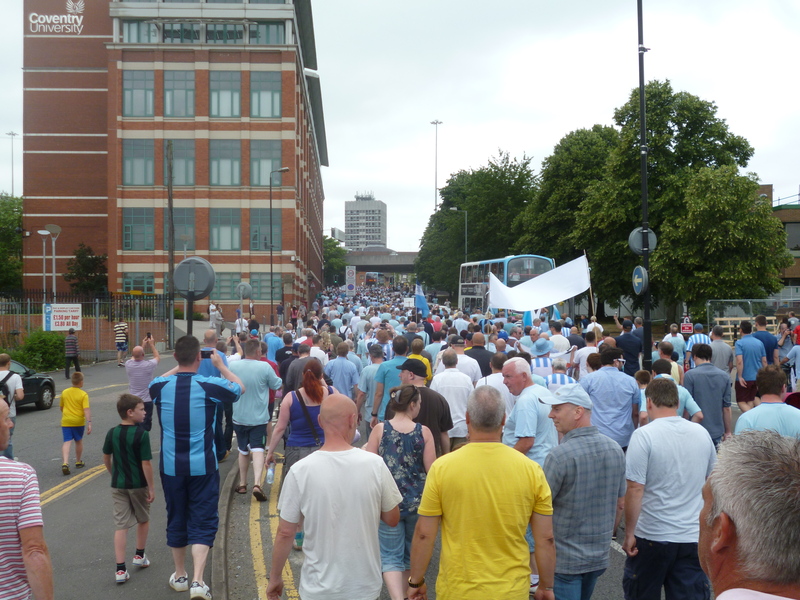 Up to 7,000 people marched through Coventry on Saturday 20th July in protest against the recent decision to move Coventry City F.C’s home games over 30 miles away to Northampton. Though predominantly Coventry fans, there were also supporters from AFC Wimbledon, Middlesbrough, Ipswich Town, Chelsea and Liverpool who attended to show support. 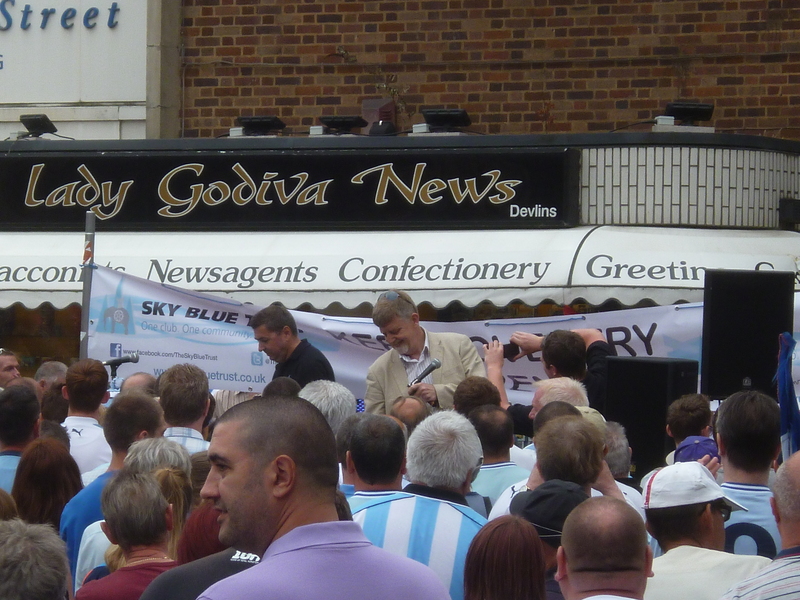 The march started on Gosford Green, close to the Sky Blue’s former home at Highfield Road and following 2 modern day Lady Godivas on horseback, proceeded to make its way to the City Centre along Sky Blue Way. 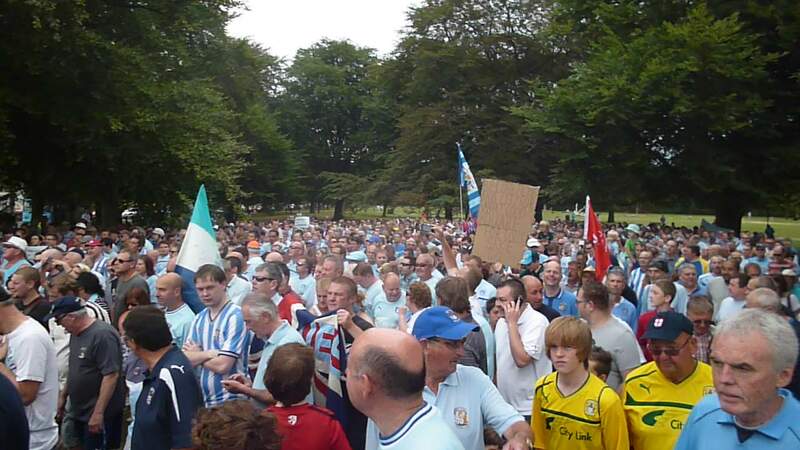 The size of the protest could be seen by the fact that the front of the march reached the end point whilst the back was still near the beginning! Fans old and young attended the protest – there was anger and dismay, evidenced in the massive turnout but also in the chants and homemade posters and banners that had been made such as ‘SISU OUT’ (SISU is the hedge fund that many blame for the current situation) ’49 years a season ticket holder – kicked out of CCFC by SISU’ and ‘Real football for real fans except in Coventry thanks to the weak Judas Football League’. 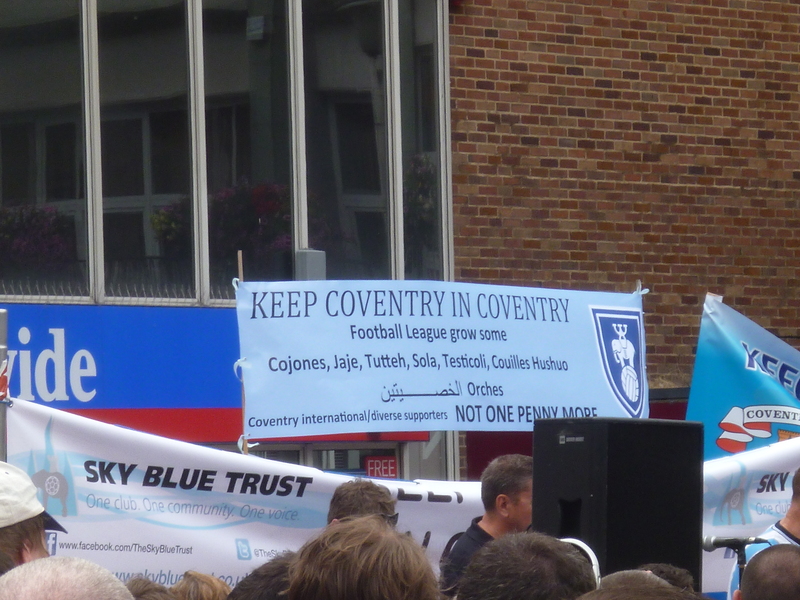 Another banner from Coventry International / Diverse supporters invited the Football League to grow some (specific body part!) in 9 different languages which summed up the feeling of many. 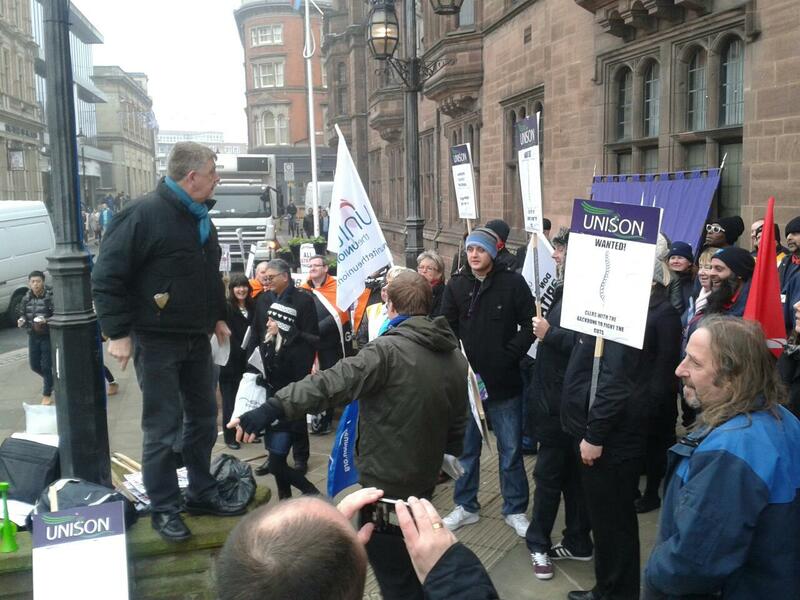 Dave Nellist was invited to address the final rally in Broadgate Square. Dave pointed out that back in 2003 it was the 3 Socialist Party Cllrs who had the casting vote over whether the new Ricoh Arena would be built. He went on to explain how the Socialists moved an amendment which was passed to guarantee jobs for people in the city, and any profit made from sales of land should go back in to services to care for the old and young of Coventry. However, Dave pointed out that looking back a mistake had been made. We should have moved an amendment that ensured that the fans had a representative on the Board, as they do in many other countries. Dave went on to point out to rapturous applause that whilst in other countries there are clubs owned by the fans, we have here a situation where a hedge fund that lives offshore is only interested in raking as much profit as possible from the people of Coventry. 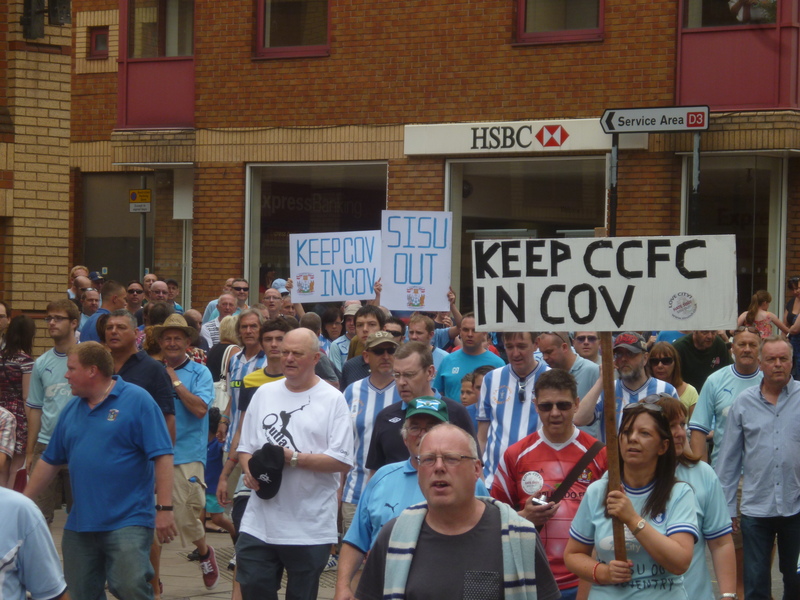 Messages of support came from fans groups across the country, including from Bristol City supporters, who stated they are planning to boycott their away game against Coventry (in Northampton) on the first day of the new season. Socialist Party members were on the protest, selling a number of Reclaim the Game pamphlets, and advertising a forthcoming meeting in Coventry on the issue of football and big business. See details below. 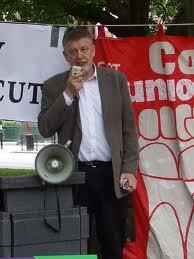 Whilst an MP and then later a Councillor, Dave was a firm supporter of council workers and trade unionists in the city. As the article below states which is taken from the BBC website, he is still an active member of the Socialist Party and continues to support the trade unions and the fight for socialism. We urge you to consider joining the Socialist Party to help rebuild working class political representation and organisation in Coventry and beyond. 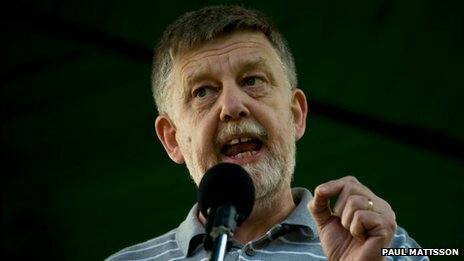 As many MPs rush to condemn proposals to give them an 11% pay rise, few have taken the lead of the former member for Coventry South. From his election in 1983 to his deselection by Labour in 1992, Dave Nellist kept less than half his salary. Along with two other Labour politicians – Terry Fields, MP for Liverpool Broadgreen, and Pat Wall, MP for Bradford North – Mr Nellist chose to “get by” on a wage closer to that of the people he represented. Mr Nellist, now 60 and still an active member of the Socialist Party, was unemployed for the six months before he was elected, but had worked in a factory for many years. He would only accept the average wage of a skilled factory worker in Coventry, which amounted to 46% of his salary as an MP. Each year the remaining 54% was donated to charitable and political causes. Mr Nellist said he saw his political career as being akin to that of a union rep in a factory. “At the time time, we were going into the [MP] job like a convenor in a factory, we had the time to do the job but not three times the wage or holidays,” he said. “The engineering union used to work out the returns of all the factories in Coventry and averaged their wages – equivalent to £28,000 or £29,000 nowadays – so that was what I took home. He said receiving less money did not damage “the responsibility” he had to his family and he was very proud of the way his children grew up. “They didn’t want for anything. We went camping as a family for two weeks every year – and still do – like many people. Mr Nellist added that as a Coventry City Councillor for 12 years until 2012, he continued to take home the same wage by reducing the hours of his full time job at an advice agency. He dismissed the idea that the more someone is paid, the more they will achieve. “Why should MPs be any better? How many millions have we been paying the bankers, how many millions do we pay footballers? On Thursday the Independent Parliamentary Standards Authority (Ipsa) said salaries should increase to £74,000 by 2015, but perks should be cut and pensions made less generous, something Mr Nellist described as “scandalous”. “The suggestion by [Ipsa chairman] Sir Ian Kennedy that the pay rise would be a way of keeping MPs from claiming more expenses is frankly amazing – I was almost lost for words,” he said. Mr Nellist believes public representatives like councillors and MPs should be able to empathise with the people affected by political decisions. “With a 9% average fall in people’s earnings, MPs should not be getting a rise – it insulates them from those day to day problems like food and fuel which have rocketed. Mr Nellist fears the impact of the proposed pay increase for MPs will add to a perceived disconnect between the public and politicians. “I think it will contribute to a growing disillusion in politics and politicians in general – at a time when millions are having it very tough, those people who may lose their jobs could become very angry if this happens.